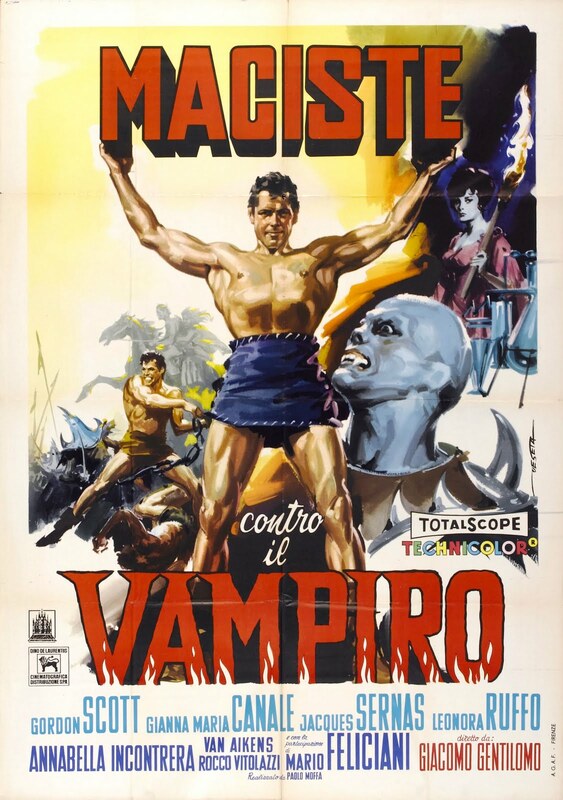 "Under the same conditions, Sergio Corbucci confirmed to us how he started the shooting of MACISTE CONTRE LE FANTOME, finished by Giacomo Gentilomo, who later directed MACISTE CONTRE LES HOMME DE PIERRE (HERCULES AGAINST THE MOONMEN), a lot less successful on many levels." However, during a brief chat on January 11, 1993, star Gordon Scott discounted that story. WC: Do you remember which was the first film that you did in Italy? Most people seem to think that it was DUEL OF THE TITANS. Gordon Scott: No, it wasn't. It was the one in Yugoslavia for Dino De Laurentiis. The MONSTER... What the hell name was it? WC: Oh, GOLIATH AND THE VAMPIRES. One of the stories that's come up is that Sergio Corbucci directed some of it. GS: No. When we shot it there, Corbucci came over from Italy - we shot it in Yugoslavia -, and Corbucci came over and he had the script for ROMULUS AND REMUS, which you know is DUEL OF THE TITANS. He gave me the script there, but he was never involved in THE VAMPIRES. WC: How did you like working with him on ROMULUS AND REMUS? GS: Oh, he was great. You know he had a great sense of humor, and he put everybody at ease. He was very easy to work with. Yeah, we both liked him. WC: You both? You mean with Steve Reeves? WC: I don't know if you remember, but in GOLIATH AND THE VAMPIRES you have to fight with yourself. GS: Yeah. I really had to move quick. (laughs) The guy that did that (with me) was a kid called Giovanni Cianfriglia. 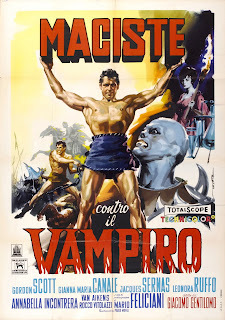 WC: He was Steve Reeves double. GS: Yeah, for a long time. He was good, too, you know? Not a bad actor, either. I think later on he did second unit work with a bunch of the people over there. He was very good. WC: I remember he did Westerns under the name Ken Wood. GS: Oh, did he? I didn't know that. WC: Any particular memories about either of those films? Does anything come to mind? GS: Yeah, the one thing that comes to mind is that it was a long time ago. Another great excerpt! Scott was my all time favorite. He's very intense in all his movies. Very interesting regarding GOLIATH & THE VAMPIRE. I had been trying to figure out just what exactly Corbucci could have directed in this.